Two Sets in One! Excalibur offers the newest breakthrough in computerized chess! You get a full-featured travel unit that features an LCD to eliminate the fuss of carrying pieces. But what about when you get home and want to play "the old fashioned way"? Just plug the Chess Station into its docking station and use the included magnetic sensory board! Powerful processor plays at a tournament rating of 1750. Includes Excalibur's famous teaching mode that takes an absolute beginner to advanced levels. Includes Palm-Size Travel Unit and Table-Top Board! 73 Selectable Power Levels. 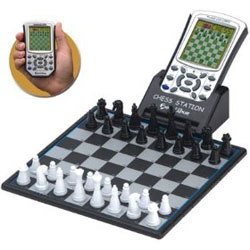 With your help we can reach more people and let them know about Chess Station whether this product works or not.